The library will be holding its annual Used Book Sale from April 4-7 in the McAmis Room (main level) of the library. On Sunday, April 7 — the final day of the sale — any items left at the sale will be sold for $1 per brown bag full. We even provide the bag! This year, we seem to have a wide and balanced selection of items ranging from adult fiction and non-fiction, young adult novels, children’s fiction and non-fiction, audiobooks, classic VHS tapes, and DVDs. Materials for the book sales consist of donations from the public, as well as books that are no longer needed in the library’s collection. 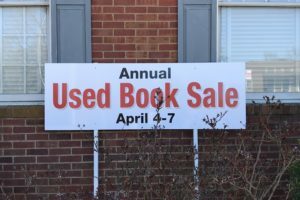 Proceeds from the book sale are returned to the library’s budget to purchase new materials for circulation in the library. The library will be closed in observance of Easter Sunday. Preschool Storytime is held at 10 a.m. every Wednesday morning that the library is open. Children’s librarian Ann Thompson shares two stories with the children, followed by a craft and singing.